In Monday’s post I mentioned that Jake has not been showing me the love for those homemade Kaufman flash cards. For those of you that are regular readers, you know that I spent a LOT of time and effort making these cards perfect. Needless to say, when he’s squirming around in the chair next to me doing everything BUT saying his words, I am beyond annoyed. Jake is still having trouble saying the /p/, /h/, and /n/ words correctly. A majority of the time he can mimic these words well, but he says them incorrectly in spontaneous conversation or if he recalls them from a flash card. This week in speech therapy he spent part of the time going over the /p/ and /h/ pages in the Kaufman Speech Praxis Workbook and the remainder of the time on new sounds. It is important to me to keep practicing these sounds at home that have not yet been mastered. What’s a girl to do when she’s tired of the same ole’, same ole’ and wants to get the creative juices flowing? Why, Pinterest, of course! I remembered pinning an educational penguin activity a couple of weeks ago, but couldn’t remember the specifics, so I went to the web site and sadly learned that it was a subtraction game. Man, was that penguin cute and easy to make though. I couldn’t pass it up and revamped it into a speech game drilling /p/ words! 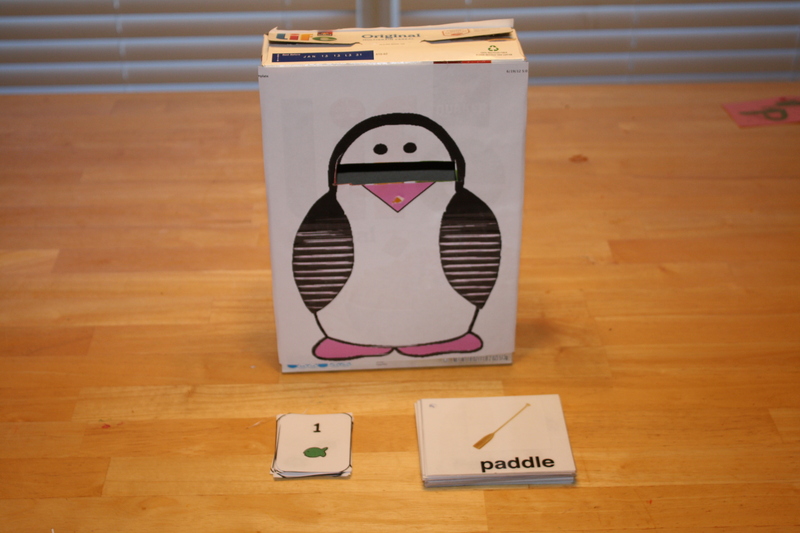 Go to www.makinglearningfun.com/themepages/PenguinSubtractionFishEatingFun.htm and print out the “penguin” and “cards” templates. Cut the penguin’s mouth out. Make sure the slot is wide enough to “eat” the flash cards. 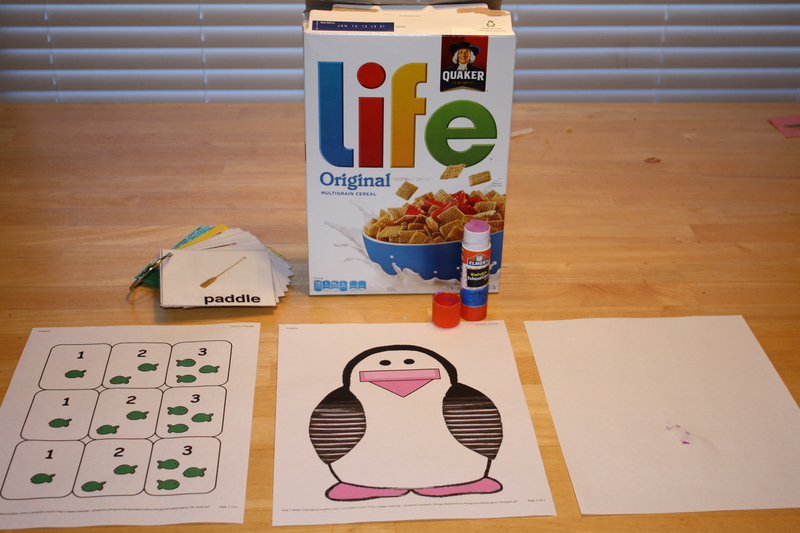 Glue the penguin to the cereal box. (You may have to trim the paper a little bit). Cut a hole into the cereal box where the penguin’s mouth is. Glue another blank piece of paper onto the other side of the cereal box. Cut out the cards. (There are 9 fish cards and each one has either a 1, 2, or 3 on it). To play, I shuffled the fish number cards and fanned them out in my hand face down. I told Jake to, “Pick a card, any card,” in my best magician’s voice. Once he picked a card, I asked him, “What number is it?” He would respond by saying, “1,2, or 3.” Then, I would draw that amount of /p/ words from the deck of flash cards and lay them out in front of him. Once he said the words correctly a few times, he would “feed” them to the penguin. The game was over when he completed all of the /p/ words, which was around fifty or so. To add extra wow to this game, I made chewing noises and a few “Mmm … good” comments as we went along. I even turned my cereal box penguin into a puppet and said silly things about all of the different /p/ words that I wanted to eat. (Pie and peaches were conveniently this penguin’s favorite foods, the pony surprisingly galloped in his belly, and crazily enough we could hear the puppy barking from the depths of his gut). Jake loved this game! He enjoyed playing it so much that he wanted to play again once we got done. Not all of my creations go over quite this good, so I was happy that I had snuck speech therapy into yet another day. Genius. I’m using that idea! My son has become burned out on his flashcards. Maybe this will be the ticket to renew his flashcard tolerance! Thanks.